Dragonclaw by Kate Forsyth. March pick for the Lady Vaults book club–DONE! The Night Circus by Erin Morganstern. Buddy read with Belle of There Are Ink Spots On My Page, Tam of The Fantasy Inn and Travis of The Coffee Archives–DONE! Grounded by Narrelle M. Harris. For review at EGE–DONE! 59. Marcus: Hell Squad by Anna Hackett. Sci-fi romance. First in the Hell Squad series. The communications officer of a ragtag military squad is forced to go into the field when her knowledge of the alien invaders’ language becomes crucial to the mission, but her presence proves distracting for the squad leader. 60. Grounded by Narrelle M. Harris. Reviewed here. 61. Rainbow Inklings by the Kraken Collective. A sampler of the works being published by the Kraken Collective back in 2017. It’s probably cheating a little to count it here, but better late than never. I’d already acquired some of the books, but there were a couple I’d missed that look interesting. 62. The Night Circus by Erin Morgenstern. Set at the turn of the 20th Century, two apprentice magicians duel by creating fantastic displays for a circus. I honestly wasn’t sure this book could live up to its hype. Instead, it has become one of my all-time favourites. It has a wonderfully mythopoeic feel which I adored, and the relationships between the characters are captivating. Very imaginative and highly recommended. 63. Tea and Sympathetic Magic by Tansy Rayner Roberts. Fantasy novelette. Mnemosyne would rather be a spinster than marry her cousin, the Duke, but her mother has trapped her into attending one of his house parties. While there, she forms an unlikely friendship with the spellcracker the Duke has hired to keep him safe from unscrupulous love charms. Funny and sweet, though I would have liked it to be a little bit longer. 64. Once Upon A Winter’s Eve by Tessa Dare. Historical romance novella from the Spindle Cove series. When a mysterious stranger crashes a ball and collapses in a bloody heap, only wallflower Violet can speak his language. Surprisingly action-packed. Violet may be a wallflower, but she knows how to stand up for herself. 65. The Calculating Stars by Mary Robinette Kowal. Alternate history science fiction. First book in the Lady Astronaut series.Read for the LDUH book club. When a meteorite wipes out most of the east coast of the US, the nation accelerates its space program. Pilot and mathematician Elma is at the forefront of the push and is determined to journey into space herself. The book does a great job of examining the racism, sexism and bigotry of the time and how it works against Elma. It was also nice to see that Elma herself isn’t immune and even though she works hard to combat her prejudices, she still sometimes trips over her blind spots. However, I did find the relationships–particularly those between the women–suffered a little thanks to the focus on the bigger picture. 66. Dragonclaw by Kate Forsyth. Epic fantasy. First in the Witches of Eileanan series. Read for the Lady Vaults book club. An apprentice witch must leave the sheltered valley in which she grew up in order to meet her destiny and save her fellow witches. I really enjoyed the magic system and the sheer number of women making up the cast. Unfortunately, the constant Scottish accents and the numerous instances of sexual violence means I won’t be pursuing this series any further. 67. The City in the Middle of the Night by Charlie Jane Anders. Science fiction. When Sophie is left to die on the night side of her tidally-locked planet, she is rescued by one of the fearsome creatures native to the planet. A thoughtful but dark exploration of colonialism and toxic relationships. 68. Accidental Abduction by Eve Langlais. Sci-fi romance. When Megan is left to drown by her nefarious fiance, she is accidentally rescued by one of the most notorious mercenaries in the galaxy. Not really my jam. The hero was a bit too alpha-hole and there wasn’t enough emotional development to convince me of the relationship. 69. Creative Wisdom for Writers by Ronald Fishman. A collection of quotes about writing, most of which were of course from white men. The section about editing presented a very uniform view of the process as being about subtraction. 70. Valentine by Jodi McAlister. YA fantasy. First in the Valentine series. Reread. Previously reviewed here. 71. 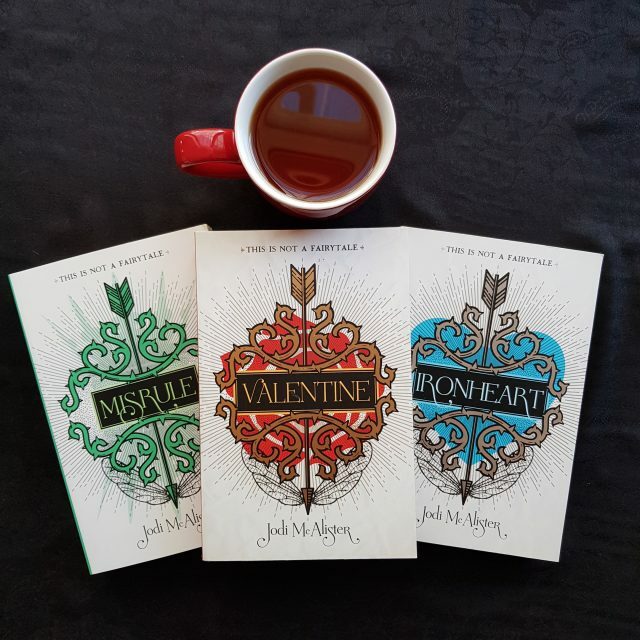 Ironheart by Jodi McAlister. YA fantasy. Second in the Valentine series. Reread. Previously reviewed here. 72. Misrule by Jodi McAlister. YA fantasy. Last in the Valentine series. Review forthcoming. And Never Been Kissed by the hoyden and twentysomething. Hockey RPF. I’m not generally an RPF person, but I picked this up for the Not Now I’m Reading podcast. I’m also not a hockey person, so I found parts of this hard to follow–more for the fact I had no idea of the significance of people than for any technical hockey aspect. However, I am a fan of slow-burn romance and this was certainly that (and deliciously so). Being RPF, this is locked to members of ao3 only. a thing that wants by magdaliny. MCU f/f fanfic. Bucky decides to find Natasha a girlfriend. Picked up as part of Kay Taylor Rae’s thread of f/f fics. I particularly enjoyed Nat’s struggle to relate to her dates while keeping what she does a secret. Wireless by Alex Acks–For review at EGE. Tides of the Titans by Thoraiya Dyer–For review at EGE. Kalpa Imperial by Angelica Gorodischer–For the Lady Vaults book club. Crooked Kingdom by Leigh Bardugo–For LDUH book club. The shortlists for the Hugo Awards should be out any day now. Once they are, I will be diving right into those as well.